Laetitia De Villiers and Jean-Pierre are the owners of Goedemoed Farm and will make sure that your stay is a pleasant and memorable one. Montagu, with it’s many attractions, well preserved historical buildings and excellent restaurants, is only ten minutes drive from the farm. Goedemoed Farm offers you a tranquil country retreat and is ideally situated for exploring the beauty of the Cape. The Cottage is situated on “Die Kloof” while the Farmhouse is situated on “Brandwacht”. See the Map for directions. Goedemoed Cottage and Farmhouse nestles in tranquil garden settings on a fruit and wine farm, situated at the foothills of the Langeberg mountain in the beautiful Keisie Valley. Our establishment offers a high standard self-catering accommodation just off the famous R62. Montagu, with it’s many attractions, well preserved historical buildings and excellent restaurants, is only ten minutes drive from the farm. Goedemoed Farm offers you a tranquil country retreat and is ideally situated for exploring the beauty of the Cape. 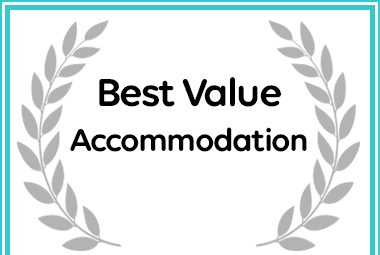 Goedemoed Farmhouse received a Best Value Montagu self catering destination Award.